Should You Be Feeding Your Local Wildlife? Right now, here in North America, we have, generally speaking, a maximum number of young, inexperienced wild animals around. And, there is, all being equal, a maximum amount of naturally occurring food for them. But, we are entering the fall: a prelude to a sharp decline in food availability for most of them. That's how it works. But, soon, winter will arrive. Let's start with ducks. 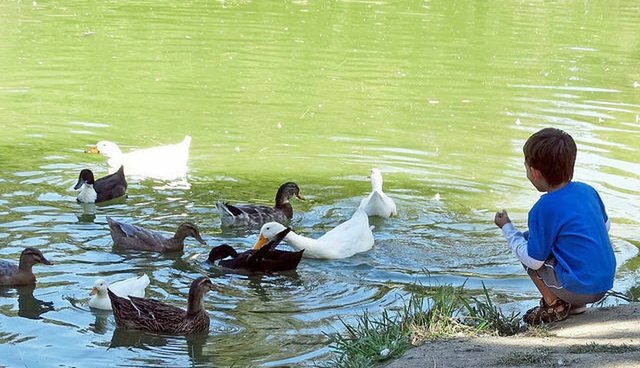 Feeding bread to ducks is a bad idea. Some argue that it causes "angel wing," which is not entirely so. Angel wing is a poorly understood condition whereby the wing of the bird (usually, but not always, a duck or goose) twists outward from the "wrist" joint. It's thought to be caused, at least in part, by bad nutrition. Bread provides inadequate nutrition and thus may be a contributing factor - but angel wing has been found in birds who either don't eat bread, or were known to not have ever fed on it. On the other hand, angel wing seems to appear more where birds are fed highly processed food, such as bread and popcorn. It is highly advised that, if you do feed local waterfowl, you give them good quality natural grains. Avoid anything moldy. Wildlife managers argue, with some validity, that in areas with harsh winters, feeding waterfowl can remove some incentive for them to migrate naturally, with negative consequences for them overall if ice and snow block access to natural food. On the other hand, once winter has arrived, if a deep snowfall or ice storm renders the birds vulnerable to malnutrition or starvation, or they are domesticated birds who were thoughtlessly released to the wild, feeding can certainly save lives. It can save lives in instances of drought, as well, as we've seen in California, where some duck ponds have, at times, nearly or quite dried out. And, in urban areas, domestic ducks and geese are often, unfortunately, placed in local ponds and wetlands, and those birds can become very dependent on handouts for survival. And, perhaps it should be noted that the same wildlife managers who scold well-meaning folks for feeding wildlife often oversee wildlife refuges where feeding is provided to waterfowl, drawing them within range of hunters. It can be a bit of a double standard. Feeding animals who are often not liked by people, in areas where such people can occur, can have very bad consequences for the animals. Most towns or cities have someone, often a retiree, known as the "pigeon lady" or some such title, who takes great pride in feeding pigeons and being fearlessly recognized by them. Often, they argue that, without their contributions, the birds would go hungry and die. But, of course, the more they feed, the more pigeons there are in an endless cycle of pigeon population growth. Unfortunately, this can all too often lead to retaliation by people who don't share the pigeon person's love of the birds. And, that can lead to mass pigeon poisoning or trapping. Most familiar animal species self-regulate population levels, more or less. Except under extreme conditions, such as a long-lasting blizzard, they don't need our help to survive. Feeding coyotes, or bears, or even deer can result in people who don't want those animals around putting irresistible pressure on government agencies to "do something" - and that too often leads to lethal culling or the use of hunting as a "wildlife management tool." Far from helping the animals, feeding them can lead to their cruel persecution. In fact, wildlife managers often like to cite the aphorism, "A fed bear is a dead bear." Mind you, they also often allow hunters to put out bait to attract bears to where they can be shot: another example of the double standard. In balance, deliberate feeding of these animals as well as the unintended provision of food should be avoided. This can mean limiting or avoiding bird feeders, accessible garbage including bulk garbage containers, barbecue leftovers (especially including barbecues and utensils coated with sauce or grease), open landfills, compost, unprotected beehives, and outside containers at fast food outlets. But, there is a huge controversy raging over another concept called "diversionary feeding." This is the deliberate provision of food that bears like, placed where they do not come into contact with humans. Wildlife managers almost universally frown on the whole idea, yet it has been known to work when shortages of natural food cause hungry bears to come into communities in search of food scraps. Recently, a friend came up with a possibly workable idea, although one that is likely far too innovative to be considered by wildlife managers. My friend suggested that people plant native fruit-bearing trees that can provide food where other natural food sources fail, to keep bears away from where they are not wanted. Where I live, a long, cold spring stunted or even prevented the normal appearance of several berry species, especially blueberries - which are favorites of bears. This has led to an increase of bears in towns. Planting or otherwise providing food sources could work. But, really, one gets the impression that the government would rather have an excuse to return to the idea of killing bears. The bottom line? Wildlife feeding is a complex issue, with both negative and positive aspects to it, and it requires knowledge of the animals. But, above all else, do not assume either that you should, or should not, feed wildlife for the sake of the animals themselves. Consider all possible factors first. No one brief discussion, including this one, can provide all of the answers.